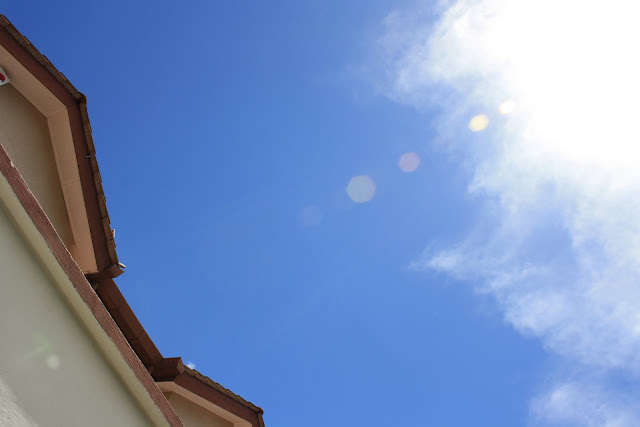 This is a warm sunny day. 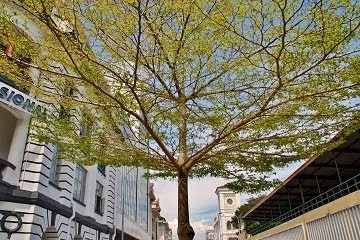 Everything under the sun looked suffering but the green trees may welcome the strong sunlight. The clear view of this blue and green combination represents good air quality. As compare to some mega cities, this might be something valuable to them. 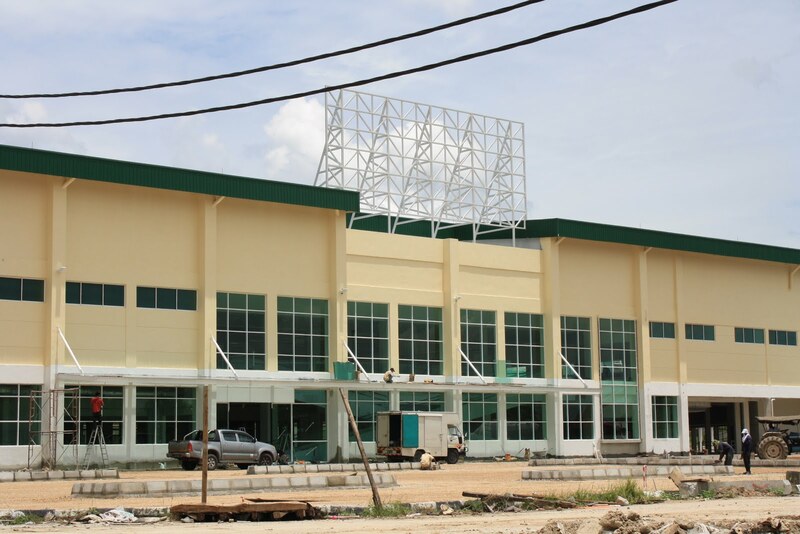 Hypermarket & shopping mall are mushrooming at northeast Ipoh. After Makro (now become Tesco Extra), Jusco, Tesco and De Garden opened along Tasek Road (Jalan Sultan Azlan Shah), a newest competitor is going to join the battle of retailing. The building construction of Giant hypermarket near the entrance of Bercham is close to completion. Despite looking forward for its opening, residents of Bercham are certainly worrying about traffic at the bottleneck of Bercham's main exit to Tasek Road will be worsened. 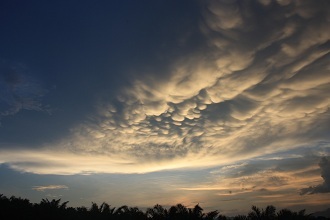 This is an amazing scene in the sky. The cirrocumulus cloud was so fine & nicely spread forming a giant natural fingerprint high above us. 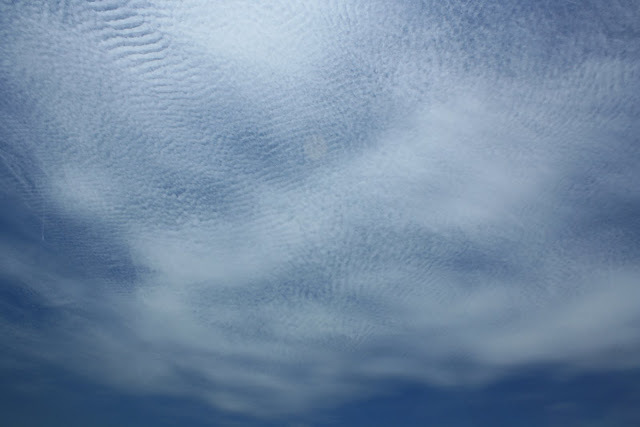 It is rarely seen even though cirrocumulus is a very normal cloud that appear in the clear morning. This scene did not last long because the cloud would disappear rapidly under strong wind blow high up there. 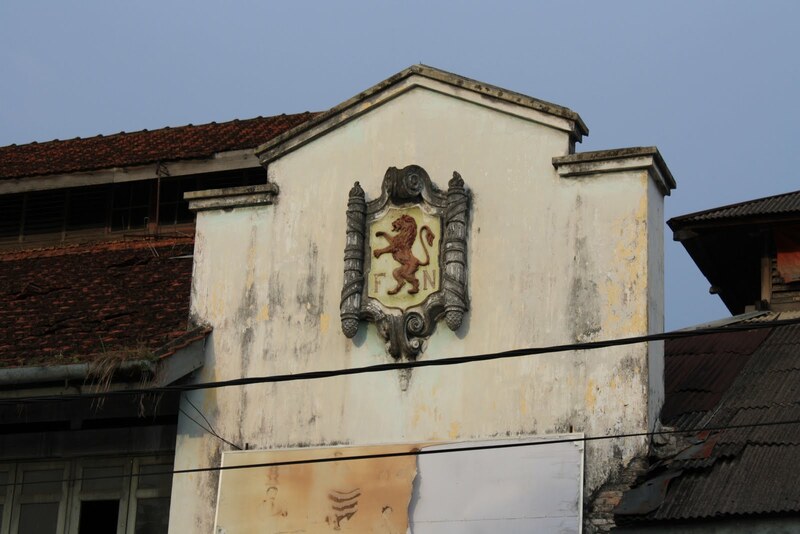 When talk about Royal Ipoh Club, for sure we will think of the heritage club house at Club Road (Jalan Panglima Bukit Gantang Wahab). 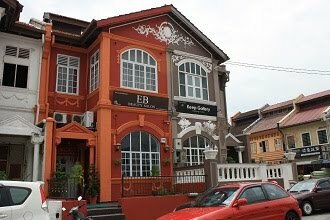 And when mention Coliseum Club, one will automatically remember the mansion at Datoh Road, but the club had abandoned the building for some years. 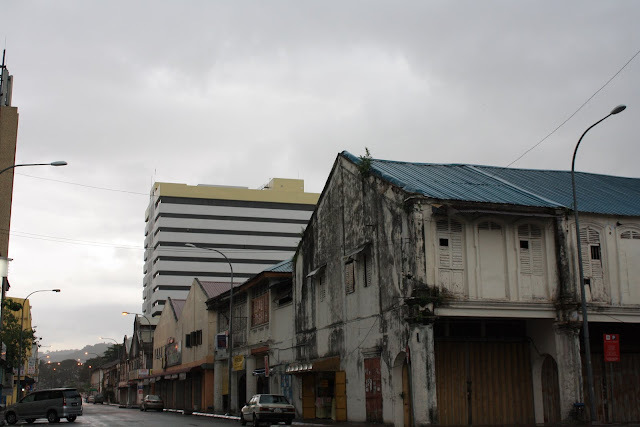 Now these names may have a link where Royal Ipoh Club will occupy this building as sports annex. 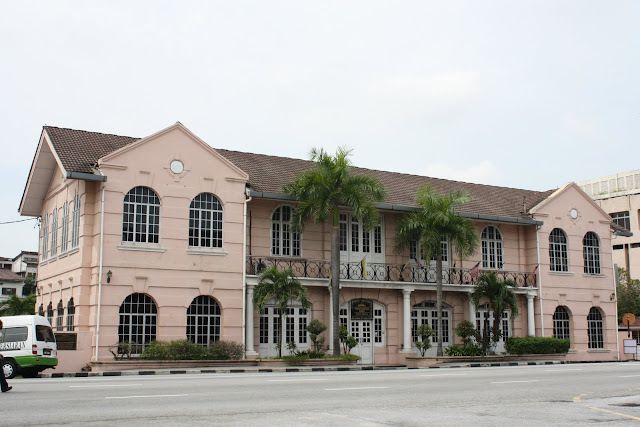 Some renovation works have began since last year but only recently the name of Royal Ipoh Club is fixed on the building. 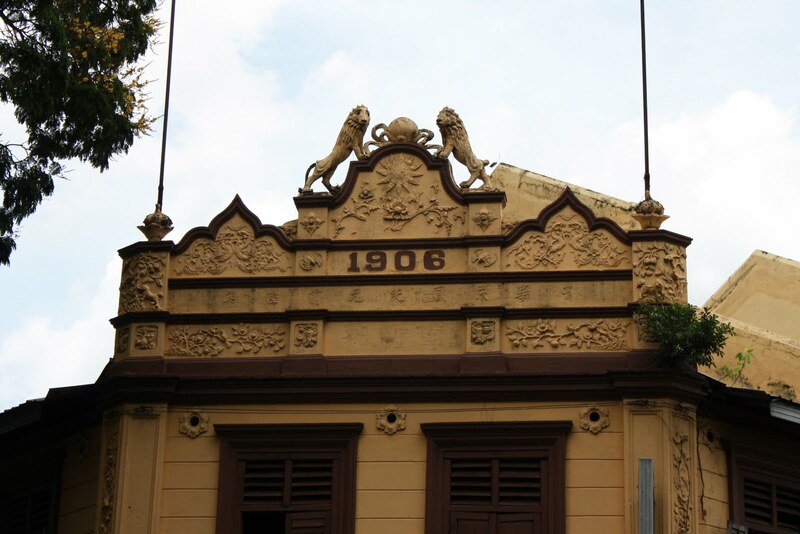 The original owner of this mansion was Lau Pak Khuan (刘伯群), a well known Chinese (Cantonese) leader in Malaysia. However, the renovation work is a disaster that destroy the beauty of this heritage building. It was built in the style of typical mid-20th century Southeast Asia mansion but is sad to see modern modifications had seriously damaged its beauty. 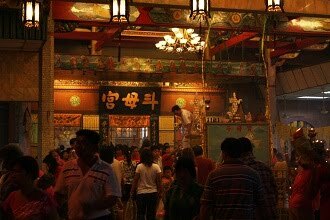 The original roof that featured tradition Chinese architecture had been demolished while the replacement is totally a disappointing piece. You can see the comparison from the blog of Ipoh World by clicking the above links. 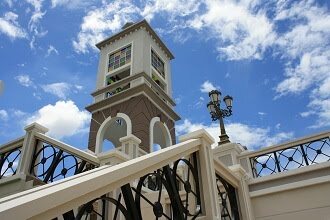 This is just another case of spoiling heritage mansions & villas around Ipoh which previously owned by local millionaires. 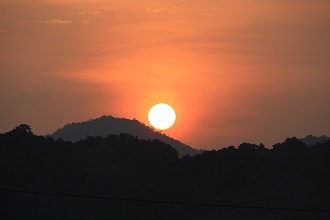 It has been quite some time I did not catch a nice scene of sun set. 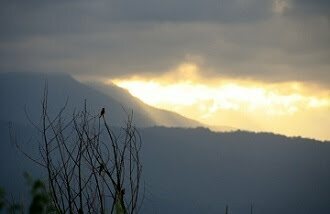 Today when driving for dinner along Kuala Kangsar Road, a silverish sky appeared at west when thin clouds covering the sun. 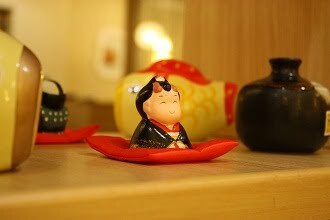 It reminded us the relaxing weekend is almost over. A brand new working week is waiting ahead. 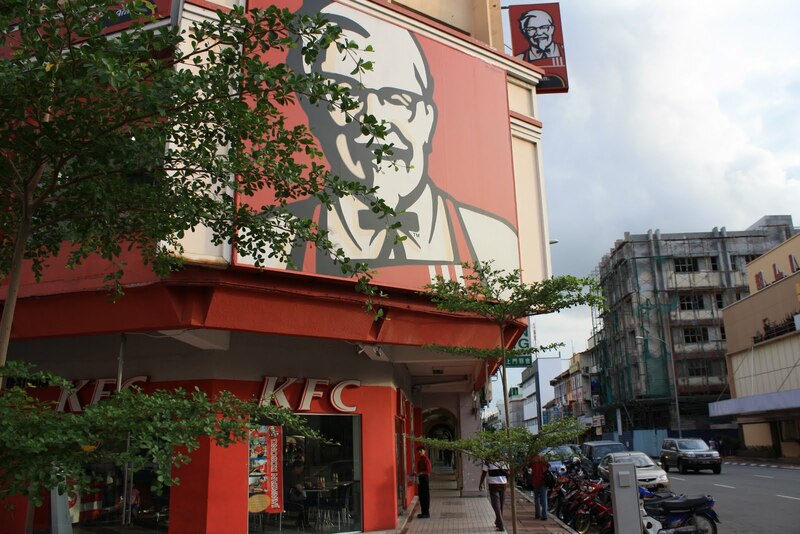 The First KFC In Ipoh? KFC is seen at almost every session in Ipoh nowadays; Silibin, Menglembu, 1st Curve, Pasir Puteh, Ipoh Garden, Gunung Rapat, Bercham, etc. 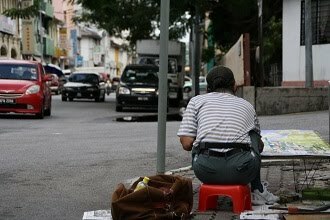 But the most familiar to many Ipoh people (I mean those at the age of 30's and 40's....haha) is this one at Cockman Street. I am sure many would remember how lucky & luxury to have meal at Kentucky Fried Chicken (at those days, it's not yet called KFC). Only during special days, especially birthday, we would be able to enjoy the fried chicken over here. 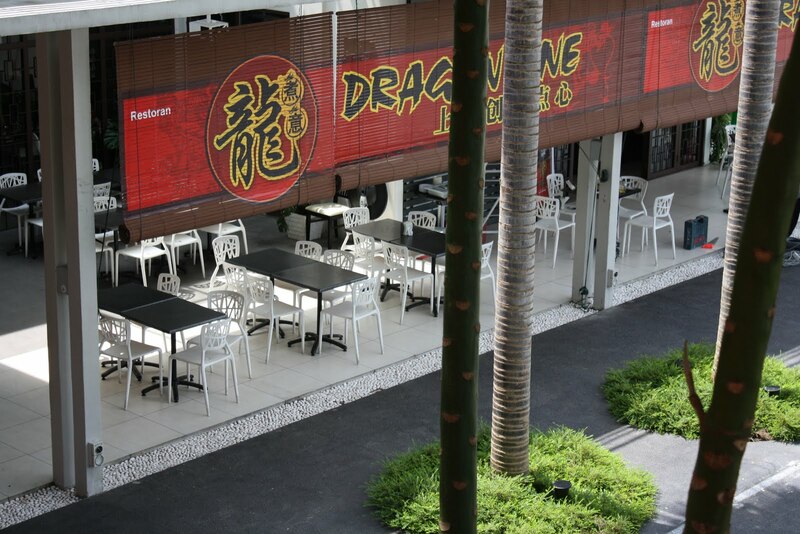 And this is not only the place we enjoyed food but also the favorite place for part time work during year end school holiday, especially those who had just completed the SPM or STPM examination. This KFC is located strategically at the previous hottest spot of Cockman Street, which is surrounded by hotel, restaurant, cinema and all kind of shops. 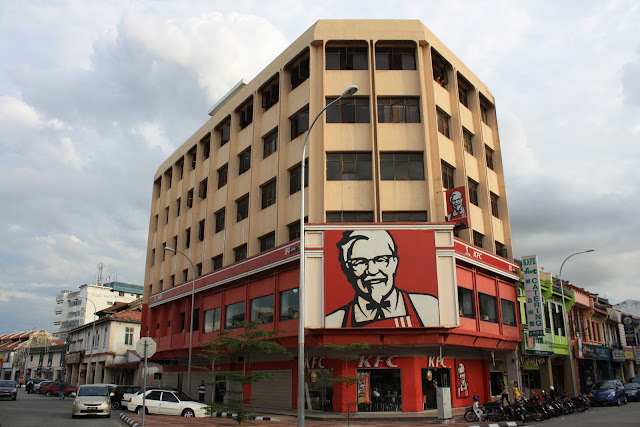 Anyway, I am not sure when was this restaurant established & was it the first KFC in Ipoh?. May be someone could enlighten me. There are more shops opened in De Garden after the expansion to the adjacent building & multi storey car park completed. 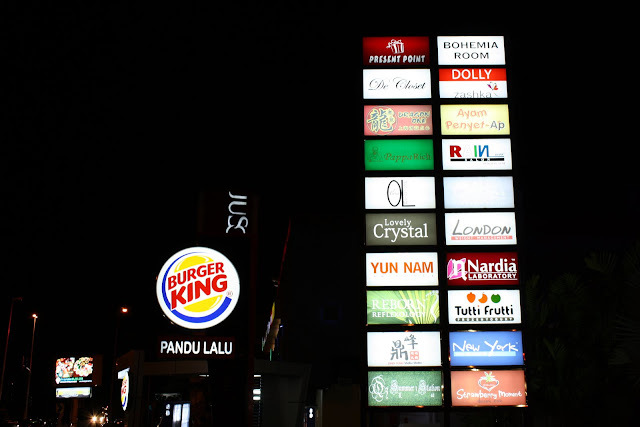 The signboard in front of its center court is already fully filled up with shop name, which consists of restaurant, fashion studio, gift shop, beauty & health care center. There are also many more which are not displayed here. The mall is recently implementing paid parking & it helps to relief the car park congestion but its surroundings, including the commercial & neighbouring residential area, would suffer heavier traffic. Driving is almost unavoidable in Malaysia. Therefore drive-through service is getting more popular nowadays. We normally have it for banking, fast food & paying government bill. Mobile phone service did not come into my mind before but it appears at Tasek Square. The huge banner drawn my attention but also my curiosity of what would be offered for this drive-through counter. I believe the counter mainly setup for selling prepaid phone card. Modern Photo Studio Still Modern? Almost all surviving old photo studios in Ipoh have been modernized to suit the current trend and demand, not only photographic equipment but also the appearance & services. 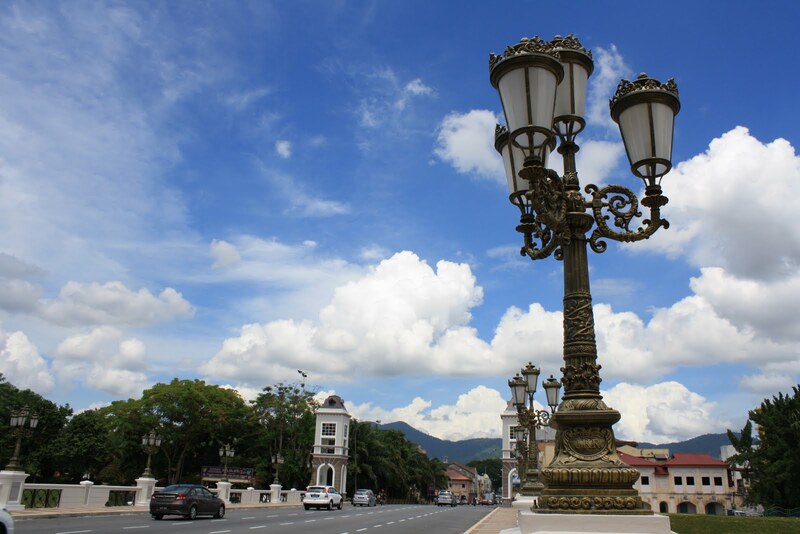 Among those, I am sure most Ipoh citizen can name Chan Sam Lock (陈三乐) and Kok Kin (国建). Nevertheless, I still find exceptional case like this old shop in Market Street, Old Town. Anyway, it's core business might have been diverted other than photography as I see the present advertisement and product at the display window is printing & photocopying cartridge. 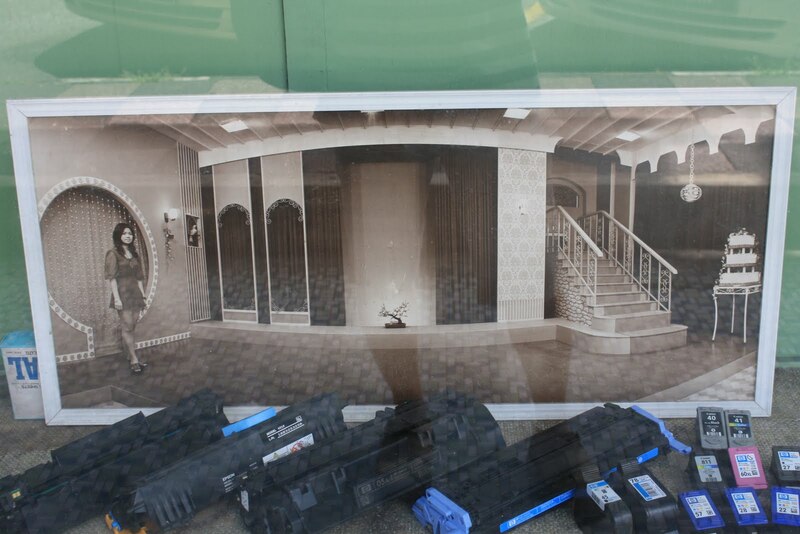 However, there is still an old photo, which probably taken in 1960's~70's, maintained in the display window. I am quite sure this must be a photo to promote its studio during the old days. There are some typical background items that were popular at that time, such as the curtain, staircase and the big wedding cake. 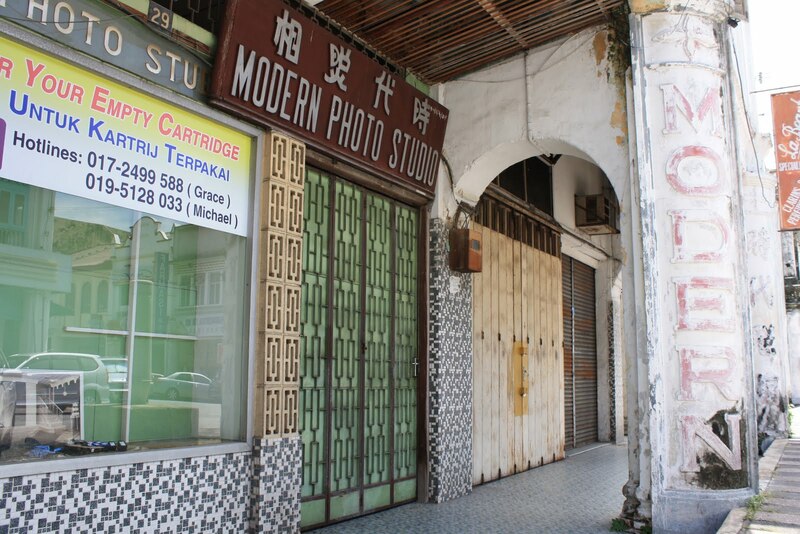 I really appreciate the owner's effort to maintain the original exterior of this studio, including the signboard, wall tiles, iron gate, text on the pillar and of course, this black-&-white photo. It's Going To Be Heavy? Today's darkness came earlier than expected. Right after lunch hour, I already seen rain fall at the mountains while thick dark clouds were covering almost the entire sky at west. Some peaks already missing in the rain curtain and I believe it would be downpour soon right at where I was. 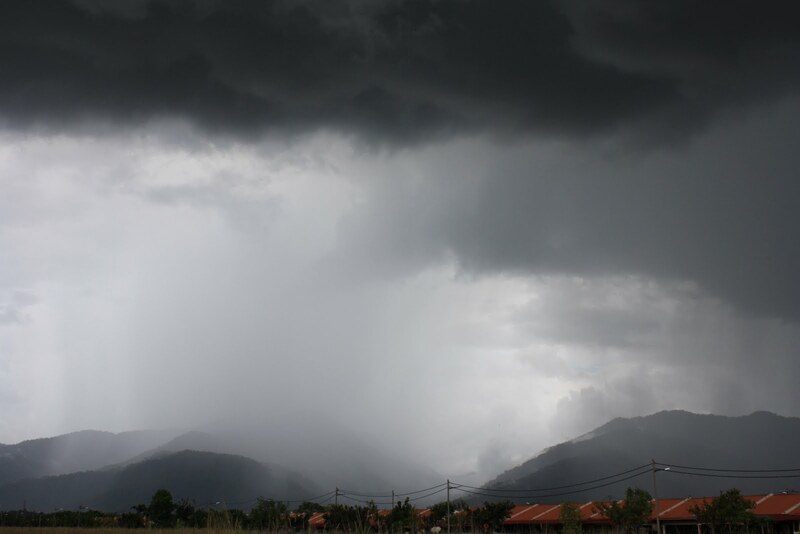 However, weather is just so uncertain to be predicted, it was only shower for a short while. 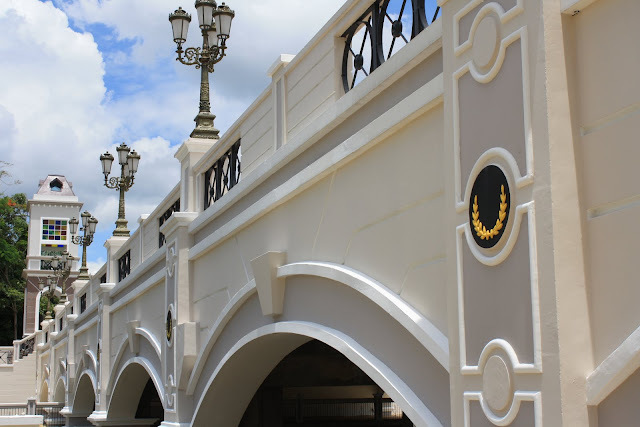 The progress of Hugh Low Bridge has been shared few times in this blog, saying goodbye to the bridge before it was closed / demolished, it's half way under construction and after reopen for traffic upon main structure work completed. 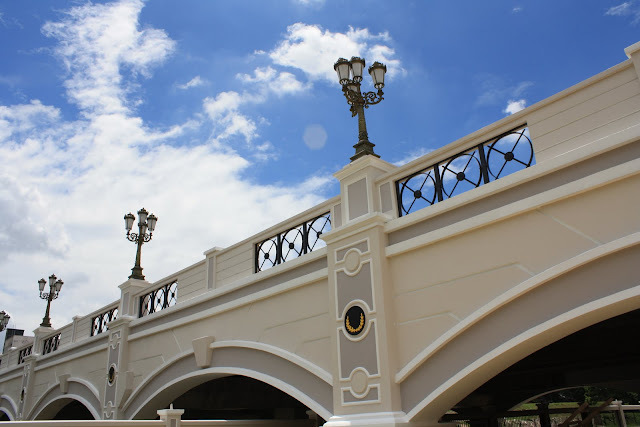 Today the new bridge appeared to be the most beautiful one in Ipoh despite some final touch up works (mainly illumination facilities) still yet to be done. Well, I feel like not to write too much to describe but the photos shall speak better than my sentences. 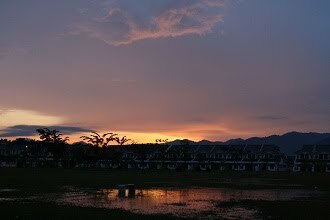 It was heavily rained in the evening. 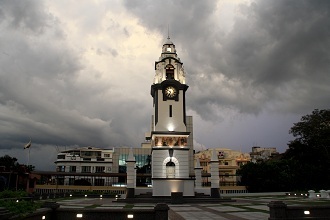 I believe the downpour swept over the entire Ipoh city and it lasted until after 9pm. However, the sky remained cloudy and I couldn't see the clear supermoon tonight. Yes, supermoon appeared tonight where Moon's distance is closest to Earth since its last approach in March 1993 which was 18 years ago. It is said the moon would be seen 14% larger & 30% brighter than normal. 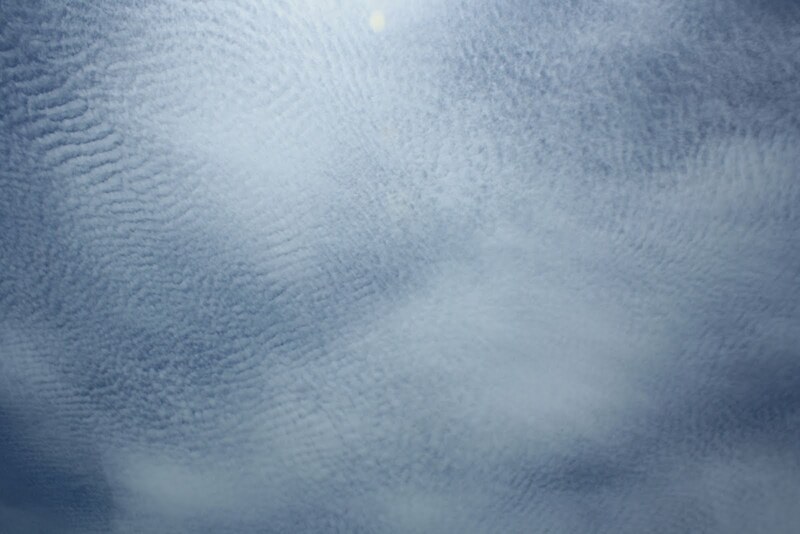 Anyway, I just couldn't tell whether I observed the same from the cloudy sky. 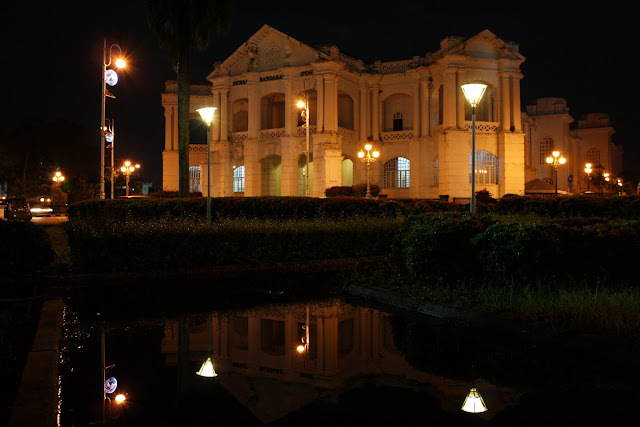 While looking at the blur image of supermoon, I found an amazing image of Town Hall on the accumulated water at Railway Station garden walkway. 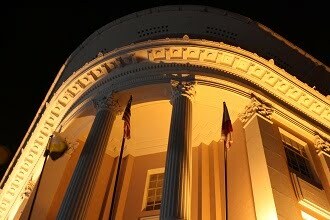 Since I was not able to capture the image of moon (not because of the weather but the limited capability of my camera), I took this image of two Town Halls for tonight's sharing. 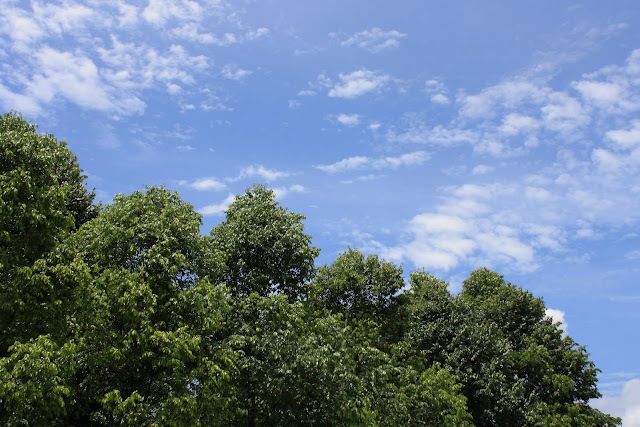 Growing clouds in the afternoon slowly invading & taking over the blue sky. This is a typical scene in the afternoon during these weeks. 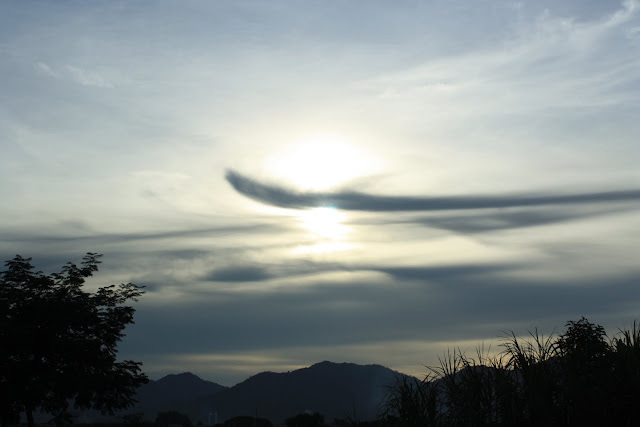 I always like to look at the clouds because sometimes it would appear in certain shape that look like something we familiar with, bird, dog, human face, rabbit, etc. 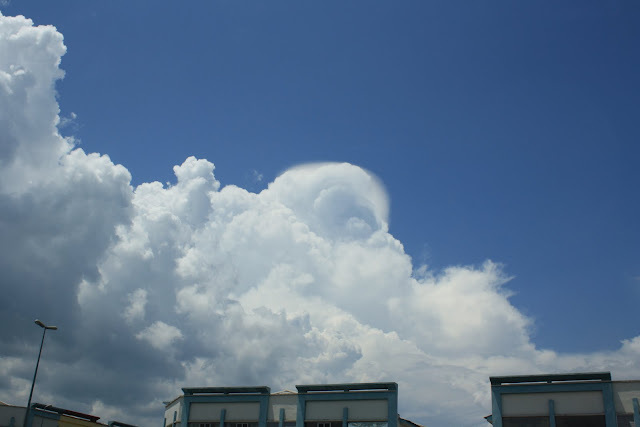 (well, may be one day I will see an UFO :-) haha) This afternoon, something unusual caught my eyes (don't worry, not UFO ;-p ), a portion of this cloud does not seen lumpy but smoothened like a half circle. I am not expert in weather observing, this may be just a very normal natural phenomenon, but I find it's quite funny looking. A peaceful De Garden when there is not many customer in the morning. Empty seats in fun pub & restaurant during day time is totally a different world. 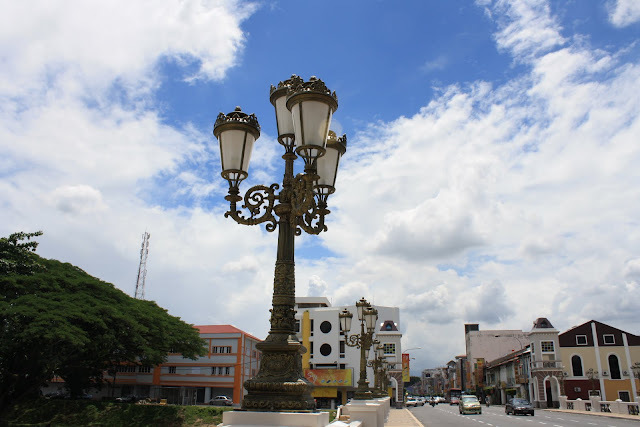 The busiest spot now in Ipoh is downtown. 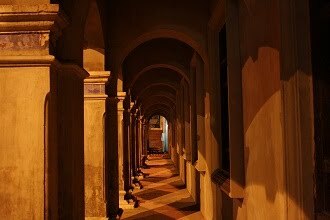 When nightfall, the situation will completely switch over, you may feel a little annoyed with the crowd here. This must be a familiar logo to many elder citizens. But I believe it is not difficult for youngsters to tell what it is, by looking at the letter F and N. Yes, that's it, "F&N", Fraser & Neave, the best known soft drink name to us. Local Chinese in the past liked to call soft drink "Holland drink" (荷兰水). Sounds funny, right? Not only soft drink but many items that came from the western world is named with "Holland", I did not investigate the reason but probably it's due to the colonization of some Malayan states by Holland in 16th~17th century. F&N was also known as "Lion brand" by locals. Well, the reason is simple & straight forward, it's taken from the F&N logo. I can still see in old coffee shop, Sun Yoon Loong, a mirror hung beside the side entrance is drawn with a lion logo of F&N written with Chinese words "Lion brand tangerine drink". 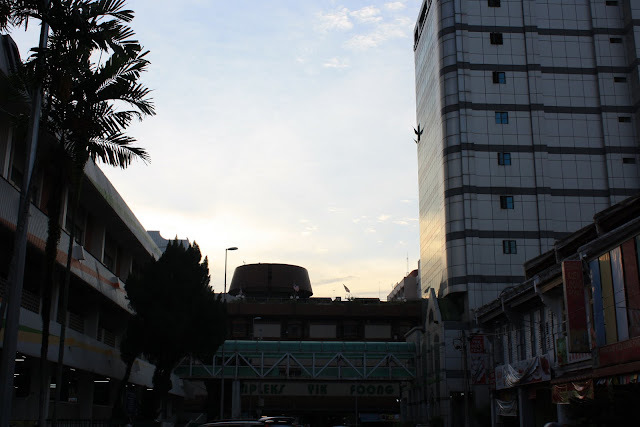 Back to talk about this building, it is just at the entrance to Conolly Road (Jalan Tun Perak) from Kidd Road. I am not sure what F&N used it for in the past but it's no longer occupied by them as they have moved to the other end of Conolly Road (facing Lahat Road flyover). 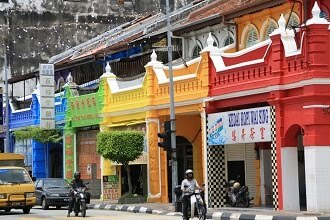 Anyway, I hope this can be consider as one of the historical building in Ipoh and will be given proper maintenance & preservation. 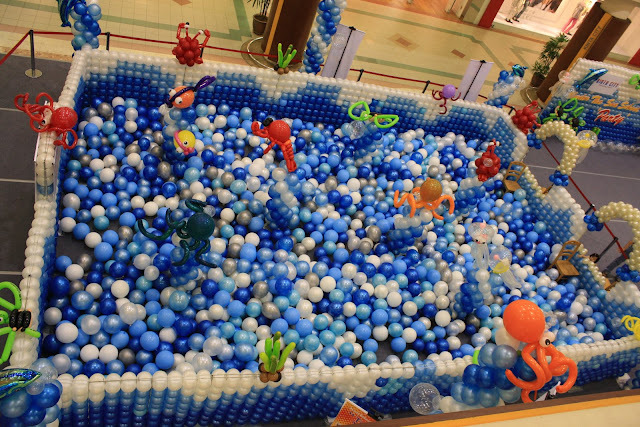 An undersea world is created with balloons at the center court of Kinta City Shopping Center. This should be a playland specially made for the children to enjoy their school holiday. I arrive here quite early and the playland is not opened yet. Anyway, this undersea world will soon be crowded not by fishes or corals but the most energetic kids that never get tired when having fun. And one thing for sure, that's the time for parents to spend. 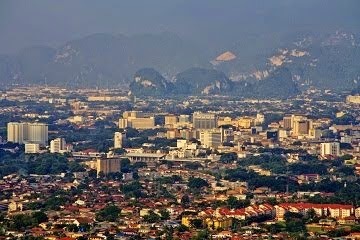 When driving along Tambun Road, there are 3 neighbouring high rise buildings nearby Perak Turf Club. 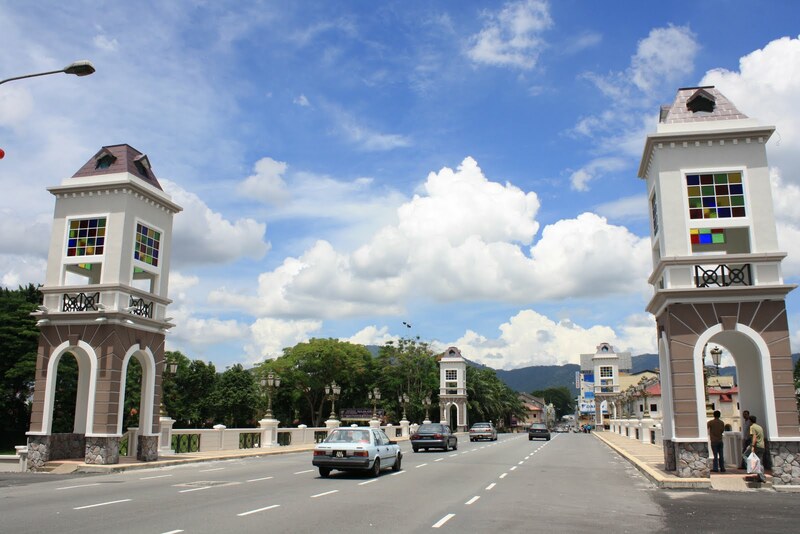 Two are Prima Ipoh Condominium which are seen in the panoramic view of this area as shared in 3-Mar-2010. 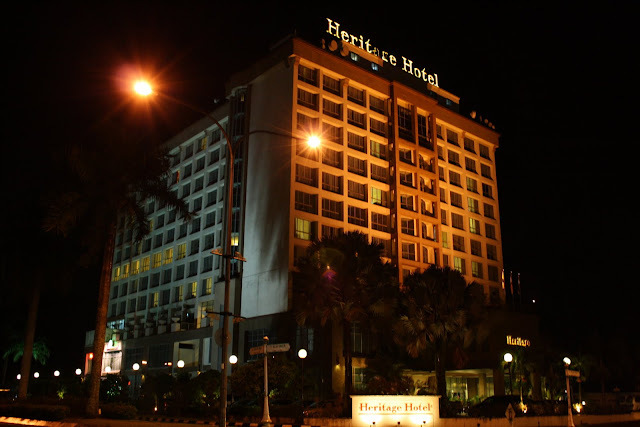 Another block is Heritage Hotel that completed more than a decade ago. Although it is not located at the heart of city center but it's just few minutes drive away and its greeny surrounding is very scenic. Jalan Raja DiHilir (Tambun Road), 30350, Ipoh, Perak, Malaysia. I like blue sky, especially the clear blue color that appear almost the entire sky. 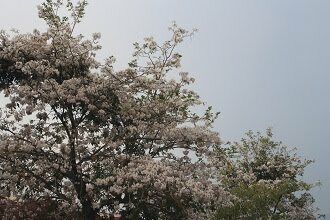 It is raining nearly every evening & night. 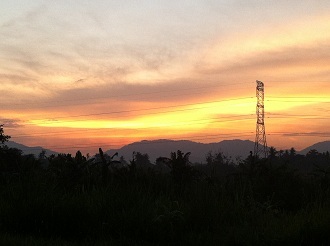 Therefore the atmosphere is so fresh & clean in the morning. 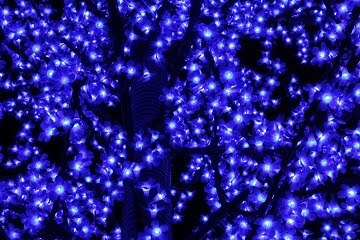 And this is when the overhead is completely blue. 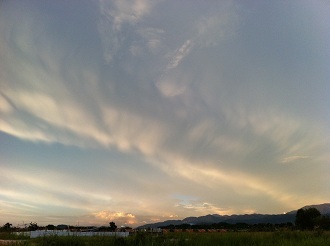 Then we can see lumps of cloud start growing along the mountain range. Soon it turns dark & raining in the evening. 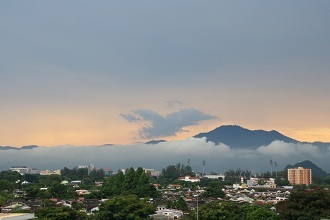 This is the moment when sun is right in the middle and layers of cloud start invading that take half of the blue sky. Old Town in Saturday afternoon is so quiet where I can see the usual fully occupied parking lots along Leech Street are now mostly empty. Shops are closed, the sky covered by dark clouds and rain drops start falling onto the roof and ground. It makes the surrounding just like an abandoned town. So many times I passed by here but not knowing the remaining pillar of an old shophouse is still "attached" to the Maju UMNO building. 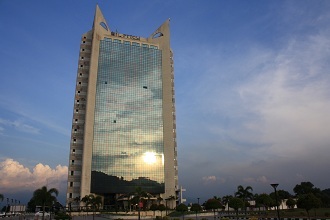 The Maju UMNO building is built on partial of Children's Playground (Taman Kanak-Kanak, in Chinese it is called 小儿运动场). 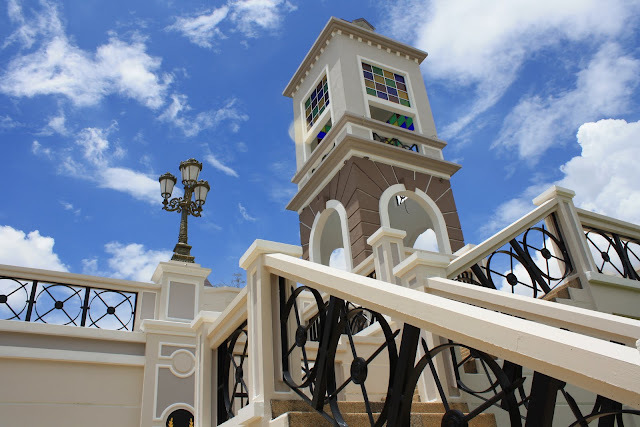 It was probably the only park in the center of the Ipoh during the early years of New Town. I have no idea how this political party can hijack this piece of public land and I do not want to raise my criticism here. Anyway, based on the above information, it makes me believe the shophouse adjacent was the first unit right beside the playground, before this 10-storey building exists. 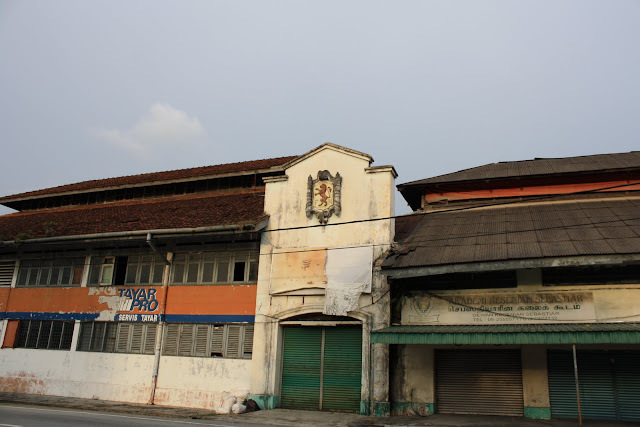 Today, those shophouses are no longer there but left only the corner unit that is facing the cross road of Brewster Road and Anderson Road, which is under very sad condition. It is definitely worse than the time I shared its image on 2-May-2009 and it is reported in recent newspaper that some falling roof tiles had hurt pedestrian. I am worrying but without able to do anything, it will be demolished soon. By then, this pillar, which is written "dry clean & dyeing", is the only piece remained. So, the demolished shop was a laundry. 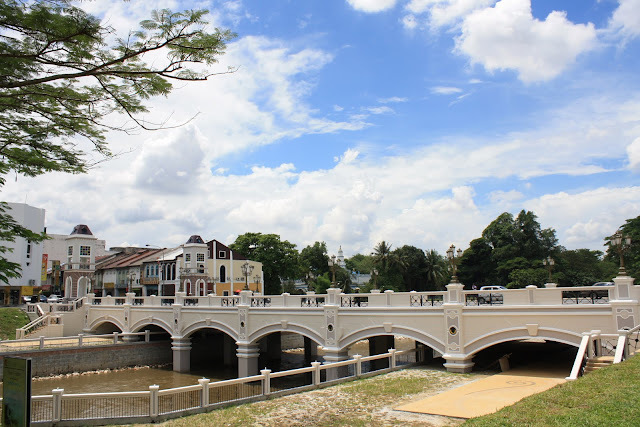 And from the second photo of this post in Ipoh World, we can see the original scene of Children's Playground and the image of this disappeared laundry. 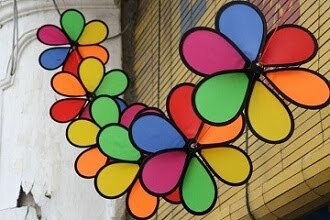 "Do Not Litter (Beautiful Environment Is Our Mutual Responsibility)". Well, signboard like this is very common in our society. There are more out there written in harsh sentences, including warning of fine for littering. Somehow, this bad habit is not eliminated, indeed getting worse. I have seen, not once but many times, people purposely came to a bridge and throw a bagful of garbage into the river. I was wondering, since he could come to the bridge, why not he dump it at the garbage bin. Throwing rubbish everywhere is just part of the life of most Malaysian, especially when more & more packaging material is used nowadays. Plastic & polyfoam containers, wrapping film, cardboard boxes, aluminium can, cigarette boxes, plastic bottle and many more, are seen everywhere on the street and corridor. 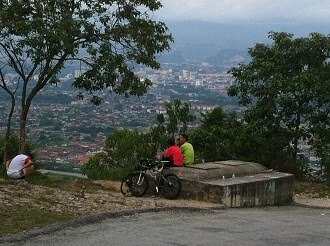 If one would claim Malaysian are living in a civilized society, I would deny it as majority of us can't even keep the simplest good habit of a civilized citizen. 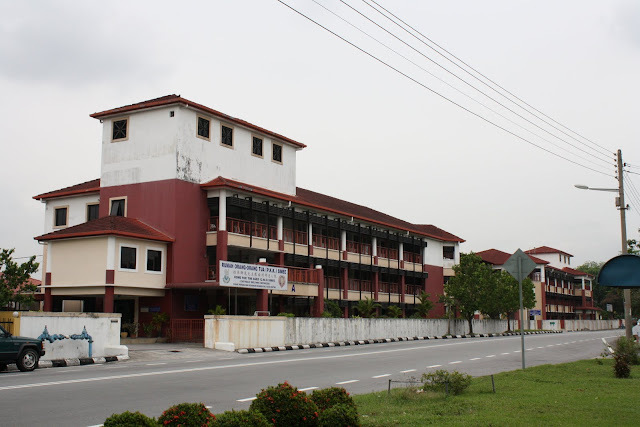 This double storey building at Brewster Road was the Kinta Fire Brigade since 1936. 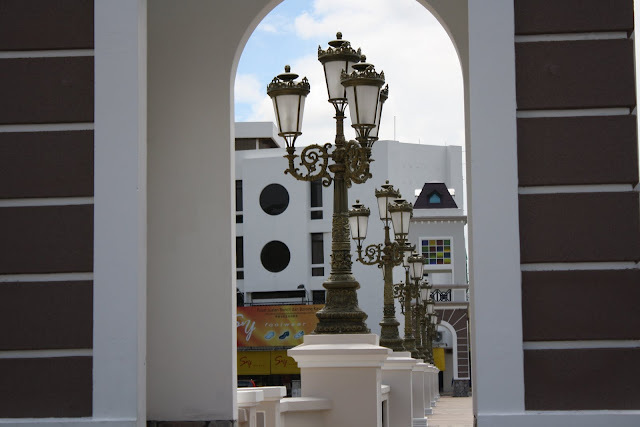 It was relocated to the site beside MBI Sports Complex at Simee in 1992 & the building was declared as heritage building by the government. 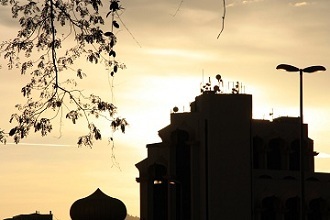 In 1998, the building was renovated & occupied by Maju Perak Development, a government linked company. Anyway, most of us may not aware that the building was not double storey originally but I have no idea when it was extended. As found from several articles, the central fire station was established in 1913, after the great fire of Ipoh in 1892 and the big blaze of Papan in 1911. And then a double-storey Kinta Fire Brigade was built. So, could this single storey fire station the one established in 1913 which later extended vertically in 1936? 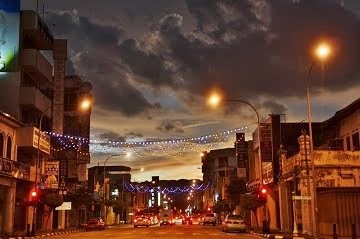 When come to the evening, Foo Choo Choon Street which is one of the busiest street in town during day time starts getting quieter. Central Market is no more crowded while it's neighbour, Yik Foong Complex is also getting lesser visitor. When night falls, this will be a silent street with only car passing by but barely any pedestrian. City life nowadays is always busy. 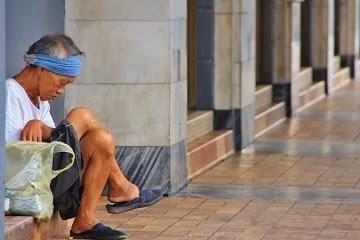 Family tends to break into smaller units & elder generation is often lack of care by the children. Many senior citizens are just too lonely & dangerous to stay alone at home and they are forced to live in home for the aged. Certainly none of them would like to do so but the present society has changed humanity so much. Number of home for the aged is getting greater while some even getting bigger. 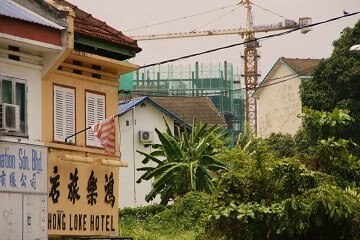 Someone may not realize that these two big buildings in Simee are, in fact home for lonely old men & women. Being grown to such a big scale, it tells us there are more & more unfortunate old folks in our society. 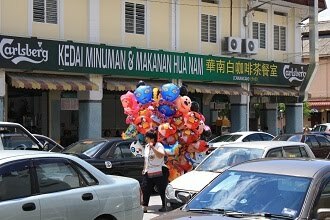 To establish or to move a Chinese primary school in Malaysia nowadays is kind of mission impossible. Anyway, there were very few lucky cases where some schools allowed to move to new site. Most of the cases are moving from low to high population area. However, for the case of Poi Lam Primary School (培南小学), it is moving due to limited space of existing site at Douglas Road which it shares with Poi Lam Secondary School. Today is a milestone for Poi Lam because the ground breaking ceremony of the primary school new site & building in Sri Klebang New Town (about 12km away from Douglas Road) is held this morning. 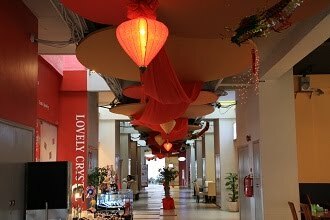 After years of planning and fund raising from the public, Poi Lam finally realizes the dream to continue its mission in a better environment & the school is expected to move in by 2012. In a warm afternoon, I meet few egrets that are looking for food at lakeside in D.R. Park. When I try to approach closer, two of them fly away & flit over the lake. At the background, the old Waller Court Flat is seen. It seems egret able to live with human & we can always see them flying in "V" formation across the sky during morning & evening when driving on the road. Right at the heart of busiest city center, thousands of people driving & walking through Brewster Road day & night. Apart from some modern buildings, Chua Cheng Bok Building at the junction to Horley Street is probably the greatest prewar building. 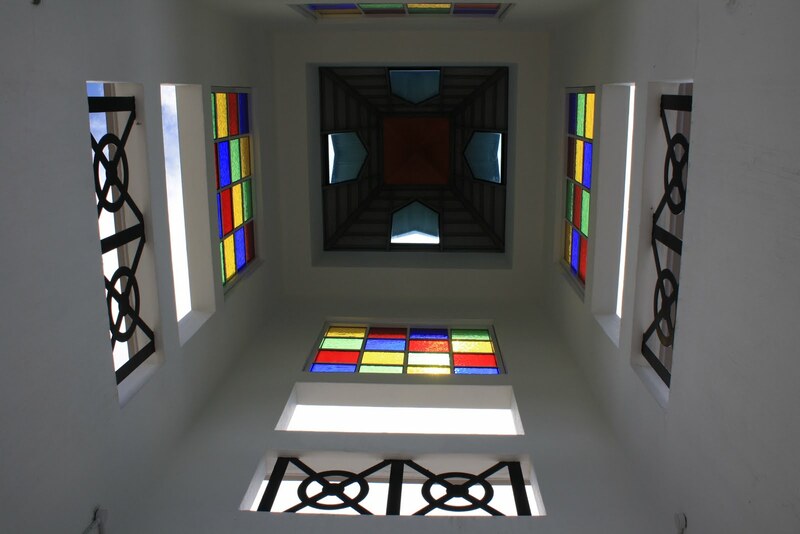 This 3-storey building was completed in 1930's. The original owner was Chua Cheng Bok, a tycoon in early 20th century. 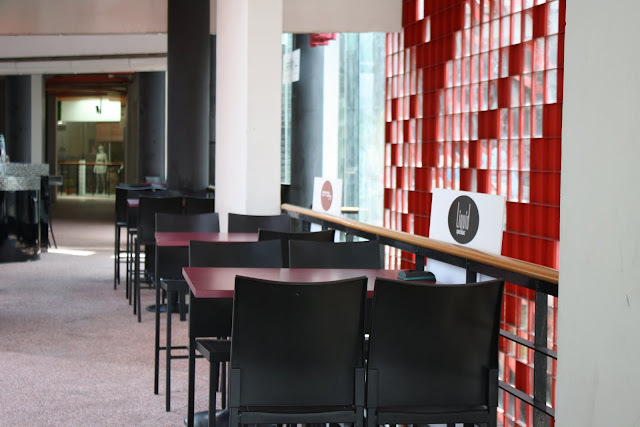 However, the building is almost completely vacant except a restaurant occupying part of its ground floor. I don't understand the reason of no tenant for a building in this hottest business district. 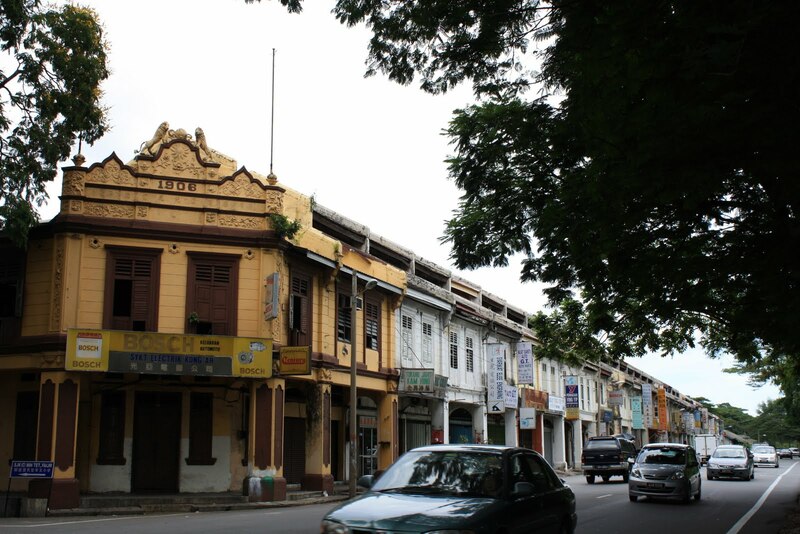 Although it's not in very bad shape now, but there is still a worry of deterioration and we may face another heritage loss in Ipoh. 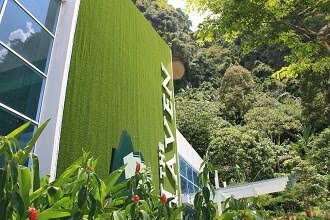 As one of the focused developing recreation park in Ipoh, Gunung Lang Recreation Park has been put up a huge text sign by the city council on its hilltop to attract visitor. 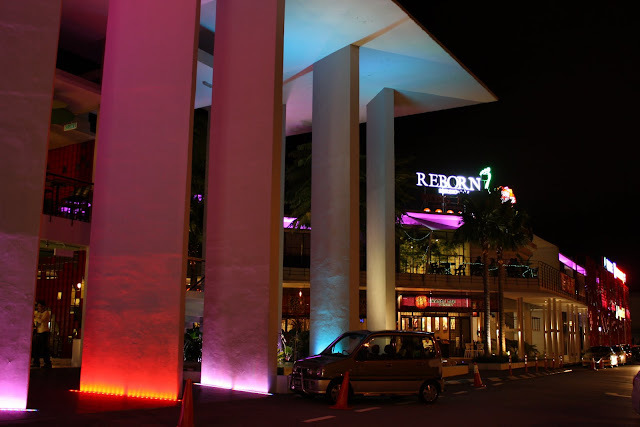 The sign is lighted up at night and can be seen from the neighbouring North-South Expressway. 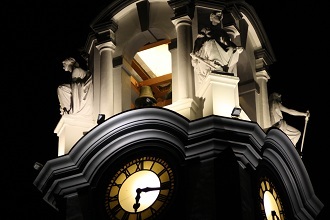 Spotlights are also installed at its bottom to shine on the limestone creating a charming scene. Anyway, the park is too isolated & quiet at night to be visited. I feel that it is only safe to be viewed from distance instead of getting off from the car and hanging around in the park. In the years of 1960's, 70's & 80's, population in the city continuously moved in to housing estates at suburban. Living in the terrace houses is different from shophouses in town. Spacious living space, car porch & a little front yard. Most women were housewives at that time & they spent their time managing housework & taking care children. 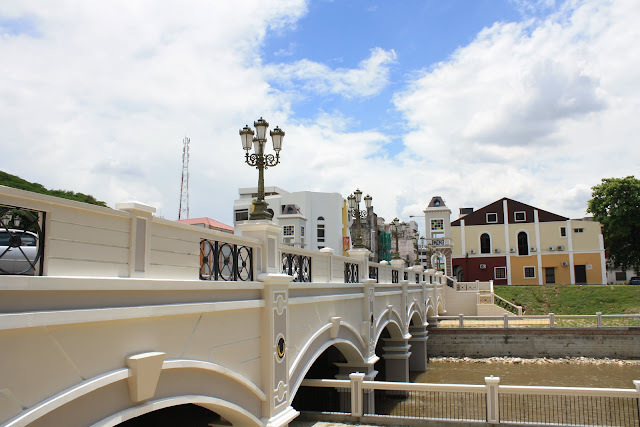 However, the front yard was simply a precious piece of land that was never available in shophouse & it was normally planted with some vegetables in middle income families. Although those days is over, families nowadays are fully utilizing front yard as car porch, but my mom still has her little farm in the yard planted with several kinds of vegetable. Leek is one of those in the farm & its flowers simply eye-catching in the evening. 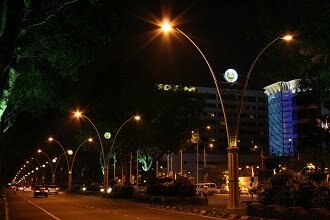 Perhaps an animated advertisement displayed in an LED billboard would be much more attractive than a conventional board. 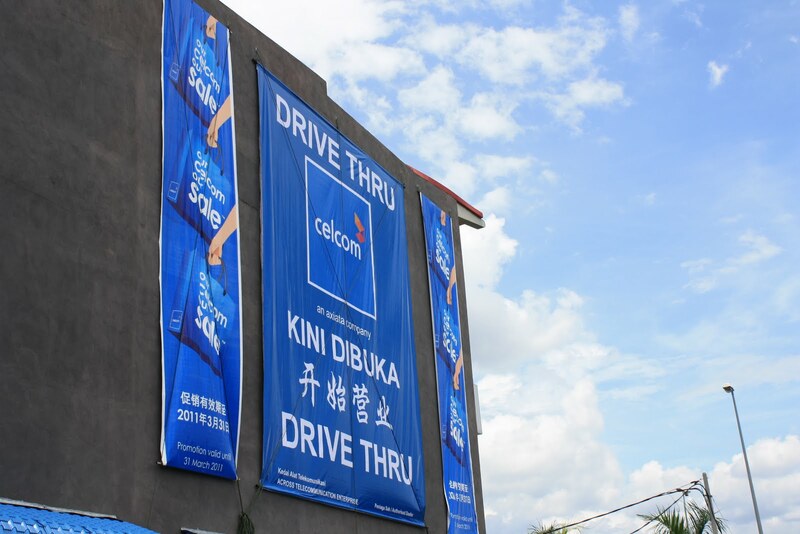 This is the third of its kind in Ipoh right in front of Kinta City, probably one month after the installation of another unit just few hundred yards away from here. As I can see a banner on a metal post next to this LED board written "UV Media coming soon", it seems one more unit will be landed here.